The Ant-Man actor says he’s thrilled to celebrate the occasion. 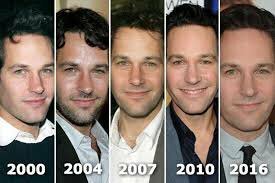 The eternal and evergreen Paul Rudd has celebrated his birthday. An ancient wizard of untold power, Rudd has come into attention in recent years for his roles in films such as Ant-Man and This is 40. In an exclusive interview with Fantastic Fools, Rudd spoke about how he manages to keep looking so young. “I made a deal with the ancient god of darkness, drawing on mystical energy from the spirit world”, said the talented comedic actor, “I’ve been doing this for over 800,000 years now. Rudd says he’s looking forward to spending another year on earth with “the mortals”, especially his role in the upcoming Avengers: Endgame. “There’s a bit where a boy on a wheelchair rolls off a cliff”, exclaimed an excited Rudd, “it’s going to be great! I’ll show you a clip sometime. As for whether or not he will ever reveal the source of his dark magic, Rudd is less enthusiastic. “Call me selfish”, he noted, “but I don’t want to dilute the power granted to me by the mythical council of elders. It’s a fragile balance and my manipulations of the space-time continuum could cause untold chaos if not properly handled. Will Rudd ever use his powers for evil? Don’t count on it, the charming actor says that he has no plans to use his ancient magic to plunge the world into eternal darkness, just to keep himself looking young. You can catch Paul Rudd in Avengers: Endgame when it releases this month.